The strength of teams lies in their ability to achieve more as a group working together than as individuals working independently on various parts of a project or activity. The main obstacle to a team achieving the optimal performance level is the ability of the individual team members to work together collaboratively. You can select the right team members based on the knowledge you need, the skills and competencies you need and the experience levels you need for a project. And the team performance can still be very disappointing if the team members do not communicate effectively, are not sharing information in a comprehensible way, and are not clear on how to coordinate with each other to avoid rework or waste their efforts working on the wrong items. Any team will go through developmental phases starting from the first day the team members spend together. If these phases are navigated successfully, they can help team members build a high level of trust which enables the team to achieve a high performance level. The leader of a team has an important role to play throughout the phases to help the team achieve their goals in the most effective and efficient manner. 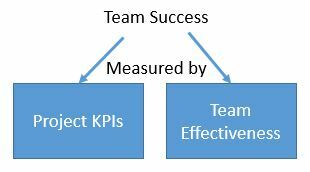 Measuring the progress of a team’s efforts is typically simply a case of setting and measuring KPIs (Key Performance Indicators) on a regular basis. These are typically set around costs, time to completion, quality of the product etc. Measuring the cohesion between team members and how well the team is functioning is not that simple. Every team member most likely has his or her own opinion of how well the team is functioning and where improvements may be needed on interpersonal levels to enhance their experience of being on the team. The Team Effectiveness Snapshot is a great way for leaders to take a quick look at how each of the team members see the team at that moment in time and identify where discussions may be needed to clarify or remove impressions that could hamper team functioning. The purpose of this quick survey is to gather input from the team on their own perspectives. Remember that a perspective is just how one person sees things at that moment in time. It does not mean that the perspective of one person holds true for the rest of the team. It is important though that you understand whether one or more team members are not feeling included, engaged or able to contribute or understand what the team is trying to accomplish. I suggest you, as the team leader, ask your team members to fill this out maybe once a month – more often if you are going through a difficult phase as a team and you are concerned about how well things are going for each team member. I would not do this more than once per week. Note that your team dynamics will most likely change when you add members, remove members or when your project enters a completely new phase of functioning and performance expectations. At those moments you are likely to see a decline in previously recorded good scores for team effectiveness and functioning. Use this tool as a way to quickly diagnose where the team is at and use it as a starting point for some team or one-on-one discussions to address concerns raised. Include an external person to facilitate difficult team discussions if you feel it may be helpful – someone from HR/Learning and Development may be able to use their expertise and skills in group dynamics, conflict resolution and interpersonal relationships to get your team out of a rough spot when it occurs.